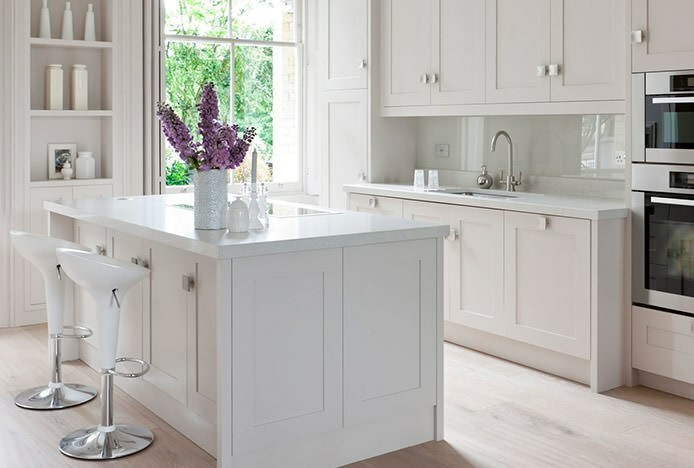 The ultimate dilemma when purchasing a stool is whether to go for a traditional four-legged frame, or one with a modern central column and round base. Whilst some customers prefer the rigidity provided by legs, others favour the dynamism a round base affords them. Both are designed for perfect poise and balance, keeping the aesthetics whilst providing excellent stability. In this article we’ll unpack the different variables to consider when making your decision. You may be under the impression that bar stools with a single stem attached to a round or square base may be somewhat unsteady. However this is a common misunderstanding and is simply not true. Whilst the seat is often wider than the base below, this does not affect the stool’s stability. Designed to support fully-grown adults, they will not tip over unless pushed with force. Nevertheless, if this is something you are particularly concerned about we do sell stools with extra heavy bases, such as the Newark. Strong and sturdy, these lower the centre of gravity for premium immovability. Plus they’re a safer option for commercial settings like bars and nightclubs, where prone to heavy usage and rough handling. Popular due to their sleek contemporary look, round or square base stools are typically sculpted from metal frames with a mirrored chrome or brushed steel finish. Allowing greater functionality, they’re much sought after due to the modern lifestyle they facilitate. Containing a gas lift mechanism within the central column, they enable variable height so each user can adjust the seat to their individual requirements. Ergonomically designed, they also possess 360 swivel for optimum accessibility and ease of use. This makes getting on and off the seat much easier when lined up against a bar, as you don’t have to disrupt those around you by moving the entire stool out. Whilst they don’t always look quite as neat if each is left swivelled at a slightly different angle, an advantage is that they can be stood a little tighter together than most four-legged models. If stools with round bases are so impressive, why then do we offer bar stools with legs? The answer lies partly with aesthetics. Retro designs like the Chrome Stool have a certain nostalgic styling, and come with four legs to keep the look of the era. Similarly traditional wooden models with natural oak or walnut finishes, like the Oslo, are widely liked for their classic charm and warm farmhouse aesthetic. Yet despite their conventional shape, four-legged frames also allow for modern styled designs in mirrored chrome or brushed steel, as seen in the Leah. The strongest of them all, welded four-legged frames offer premium solidity as they contain no moving or detachable parts. Many, like the Healey, are also stackable to allow for convenient compact storage. 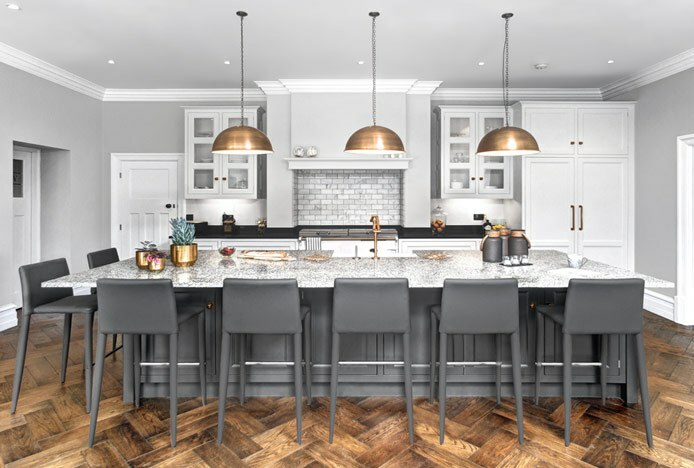 Yet whilst central column stools spread their weight across the surface of the base, those with four legs can sometimes dent soft flooring like laminate or bamboo, as the weight is concentrated on four points. Nevertheless, you can get round this by attaching small felt pads to the underside of each leg. This should help to minimise any indentation, along with any marking or scuffing caused by improperly dragging them across the floor. Some four-legged stools, such as the Ontario, even come with handy adjustable feet to cater for uneven floor surfaces. Another advantage of four-legged designs is the ease with which they can be pushed under a bar table with a central round base. Whilst legs will straddle the curve of the table base, a stool with a round or square base will bump into it, and hence won’t tuck as far beneath. You can rest assured that here at Atlantic we take safety very seriously. All of our bar stools are tested prior to sale, and consequently offer the highest levels of stability and sturdiness. Whether you choose a stool with legs or one with a round base, it all comes down to the style you prefer. A quick guide to the different footrests you'll find on our bar stools.. Compact or comfort? 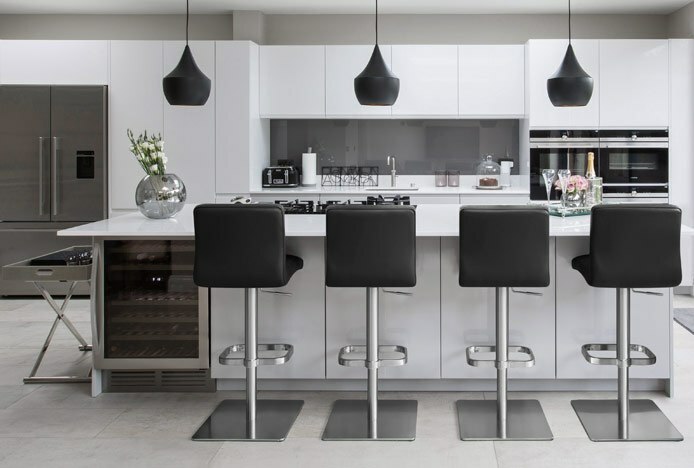 A quick guide to choosing stools with or without arms..
From salons to surgeries, bar stools with wheels are ideal for any space..
From base to seat, learn more about the parts that make up our bar stools..